You don't find Generation Zero, they find you. Our story opens with a teenager named Keisha trying to find the Generation Zero kids, who might be just an urban legend, but she is desperate to find out who murdered her boyfriend. There is something fishy going on in her city Rook Michigan. Rook is a city that was saved by an Emergency Manager and is now a city filled with technological wonders and is going through an economic boom. Keisha's boyfriend Stephen thought that he'd discovered the secret behind the city, then mysteriously dies in a car accident with a high blood alcohol level which was impossible because he was straight edge. 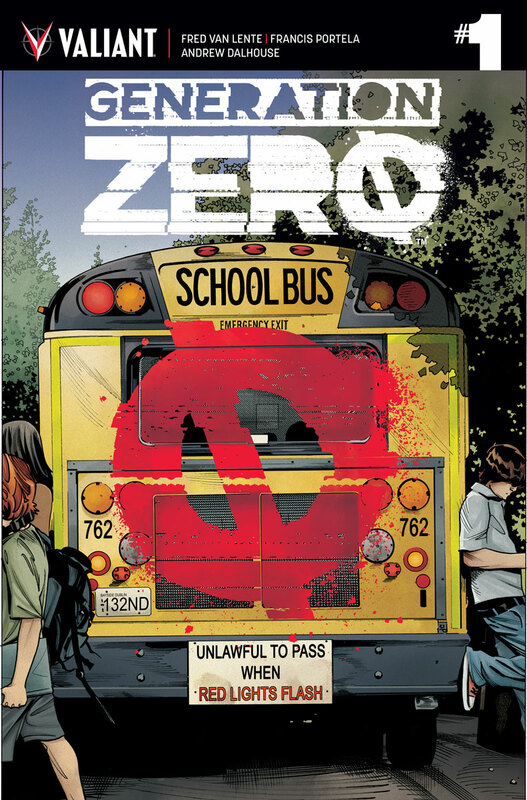 So Keisha sends out her video, does Generation Zero come to her aid or will she be left to solve this mystery alone? This was a great first issue. I really loved it. The story was really good, and left on a note that leaves me want the second issue to come out right now! The characters are familiar to me, as they first appeared in Harbinger, Bloodshot and the Harbinger Wars mini series. For those unfamiliar the Generation Zero kids were being held by Project Rising Sprit to be used as Psiot weapons, now they are free and seem to have gone about helping people in need. I love the A-Teamish concept for this book. Van Lente has been really great at universe building for Valiant, so I am glad he's taking these characters on since they are basically blank slates. The art is good and there are some really awesome pages. For the most part this is a teen dram with little to no real action so far, but it was well written and well drawn. My favourite panel is one of the last ones. There's lots of great stuff art wise. We have been without a Harbinger book for so long and now Valiant seems to be giving us a lot of Harbinger, with Harbinger Renegades, Faith and Generation Zero. Now with Gen Zero in the very capable hands of Fred Van Lente we will finally get some real depth to these characters and not just looking at the cool powers stuff. I've loved every thing else Van Lente has done with Valiant and after issue one I have no reason to feel anything different. I'm really interested in what everyone else thought of it, but in my opnion it was great. Fantastic issue, and a must buy!